AGS Lilongwe in Malawi hosted an exhibition stand at the Bishop Mackenzie International School’s Parents Fair in April, represented here by accountant Chawezi Phiri and Branch Manager Luis Fernandez. 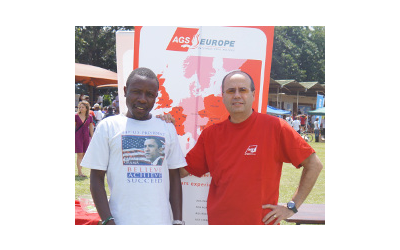 AGS Movers Lilongwe in Malawi hosted an exhibition stand at the Bishop Mackenzie International School’s Parents Fair in April, represented here by accountant Chawezi Phiri and Branch Manager Luis Fernandez. 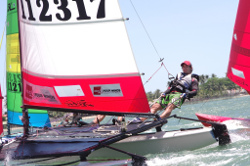 AGS Movers Manila recently benefited from wind power in the Philippines when sponsoring a Hobie Cat (sail number 112 317) competing in the 1st Annual Tanauan Sailing Festival – organized by the Taal Lake Yacht Club – on Taal Lake. AGS Movers Singapore recently sponsored the French Chamber of Commerce in Singapore’s (FCCS) Pétanque Tournament 2014, hosted at Singapore’s Mana Mana Beach Club. Pétanque is a boules-type game dating back to 1907. 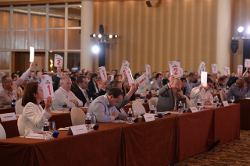 FIDI – the International Federation of International Movers – hosted their 63rd Annual Conference in Singapore from March 30 to April 2, and a vibrant team of AGS network managers and directors networked with the hundreds of industry delegates present.